Impossible to send or receive the email on the server. Local delivery does not work. Warden Anti-spam and Virus Protection extension is installed on the server. 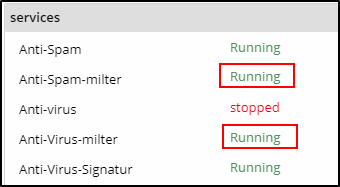 Anti-Spam-milter and Anti-Virus-milter are running in Plesk > Extensions > My Extenshions > Warden Anti-spam and Virus Protection. Warden Anti-spam and Virus Protection extension internal issue. Go Plesk > Extensions > My Extensions > Warden Anti-spam and Virus Protection. Contact the extension technical support for the assistance. Unable to create subscription or access Tools&Settings: "send() must be of the type string, null given" or "Unable to define catch-to address"